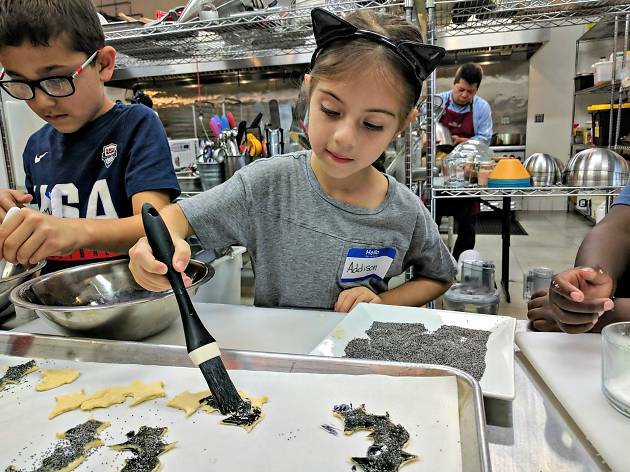 Break out the aprons at these festive cooking and baking classes for kids, where tiny chefs can learn how to whip up sweet confections and savory feasts. 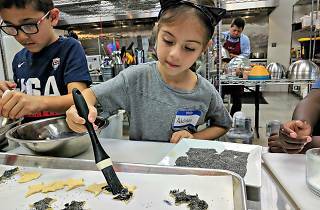 In preparation for Halloween, Thanksgiving and Christmas, sign up your tot for these stand-out cooking classes for kids. Every month, the commercial kitchen and cookware boutique hosts a series of family and kids cooking classes. This October, sign up your little one for “Kids: Halloween Treats,” a two-hour course that covers how to craft bat-shaped crackers, cheesy spiderwebs, Halloween popcorn balls and “bloody” sherbet floats. 13545 Ventura Blvd (844-454-2583). Oct 28 at 10am; $65. Ages 6 and up. Founder Nina Zippay’s passion for wellness and sustainable cuisine informs her series of hands-on cooking classes. Just in time for Thanksgiving, Radical Cooks teaches youngsters how to craft pumpkin and apple pies in the workshop “Penchant for Pies.” Children will create their own crust, fillings and even whipped cream using seasonal ingredients. Food + Shelter, 6375 N Figueroa (213-308-8954, radicalcooks.com). Nov 10 at 10am, 2pm; $65. All ages. Feeling ambitious? Sign up for “The Whole Holiday Meal” parent-child session, during which you prepare five tantalizing dishes using farmers’ market ingredients. Learn to make favorites like roasted turkey legs, garlic mashed potatoes and homemade cranberry sauce. 395 Santa Monica Pl, suite 329, Santa Monica (310-656- 8800). Nov 12 at 2pm; $125/parent and child. Ages 7 and up. In tandem with Black Friday this year, the shop holds a minicourse on how to reinvent Thanksgiving leftovers. Children can learn the basics of cooking while also mastering recipes for fall dishes like a turkey potpie and an apple-cranberry cake. It’s the perfect way to entertain your kids while you take advantage of the Grove’s serious Black Friday sales. 6333 W 3rd (323-954-0121). Nov 24 at 10am, 1pm; $49. Ages 8–12. The worlds of art and food collide in this creative culinary venture from chef and museum veteran Maite Gomez-Rejón. This December, hear about the history of chocolate in ancient and modern Latin America during “Family Workshop: Chocolate Unwrapped,” inspired by the Huntington’s exhibition “Visual Voyages.” You’ll bake holiday-worthy desserts like avocado-chocolate cupcakes and embark on a private tour of the exhibition. The Huntington Library, 1151 Oxford Rd, San Marino (310-396-4648). Dec 9 at TBA time; $65. Ages 7–12 plus accompanying adult. At this urban kitchen, measuring implements are banned and tasting is encouraged (guidelines we can happily agree on). Sign up for the sweet tooth–satisfying session “Holiday Elves” to make irresistible confections like chocolate-lavender truffles, peppermint-white-chocolate hearts, ginger- spice cookies and peanut butter blossoms. 2833 S Robertson Blvd (310-841-2738). Dec 10 at noon; $80. Ages 10 and up plus accompanying adult. Youngsters can show off their creative side at this do-it-yourself decorating studio from pastry chef Duff Goldman. This season, kids practice adorning Halloween treats and snowman-themed cakes, led by expert bakers. At the top of our list? “Holiday Cupcake Decorating” invites dessert lovers to don their ugliest holiday sweaters while dressing six cupcakes with festive confections. Prizes are awarded for Best Cupcakes and Best Ugly Holiday Sweater. 8302 Melrose Ave (323-650-5555). Dec 20 5:30–7:30pm; $39.50. All ages.